At age 30 - the age of confidence and maturity - Pham An Hai had his first exhibition of highly expressive painting in Ha Noi and established himself as one of the most recognizable young artists, with a body of artwork that he termed "expressionistic." Was it his youthful confidence, a devastating traffic accidentor mental trauma that led him to adopt such a defiant and pessimistic view in his "sadness," "love," "drunkenness" or "flustered" state of being?...But I would rather think that in his heart of hearts, the artist in him had already called up an approach for judging the world around him. Startled eyes, mouths gaping in anger, ghastly crooked and twisted human forms, schemes of harsh colour, deliberately harsh brushstrokes - all surrealistic in essence, despite their expressionistic outward appearance. The skepticism and irrationality of surrealism plus the Freudian inhibitions in these depictions were not only the reactions of his youthfulness, but were relevant to his life. One needs to recognize that such tendencies are uncommon in Vietnamese art, which commonly favours softness, gracefulness and subtlety. Humour, horror and violence are like anoverdose of drugs for a sentimental art that is prone to display art for pure enjoyment rather than for challenge and response. In such circumstances, the contemporary nature of Hai's work naturally stands out in the Vietnamese art community. 1998 was a pivotal year in Hai's smooth progress towards abstractionism. Until then, he sometimes drew realistic portraits just like most abstractionists. Kandinsky started from landscapes. Mondrian from an apple free, and Pham An Hai with Hanoi's ancient streets tinged with the occasional rooftop, uneven gables and dimly visible window frames. But further on they became blurred and gradually took on the same silhouette as if in an X-rayed image of the artist's inner being and his deepest fellings for Hanoi . No longer do his figures appear isolated from the lines and strokes that form the structure and his adept layering of pigment and use of space generate clever schemes of colours . Despite being nonrepresentational , his abstract art still vaguely reflects a certain type of landscape - spring or autumn , the reflection of the water's surface or the span of a bridge , a suburb or a street at night - no mater what the appellation may be . Sentimental and gentle in the quietest manner , his abstract paintings seem to be a counterpart or an addition to the artist's prior roaring and stormy pictures . In Hai's most recent paintings , I like the subtlety in the variation of colours and the sweet and slow rhythm of the grave and melancholy lines and strokes of the mass . They have become increasingly independent and vigorous . The scruples of mental ideas and even a mental state like "regretting the absence of the person" or a symbol explicitly termed as the "vein of life" will eventually be sunk and lost in the successive waves and currents of pure figurative elements . And I wonder at what point in time will the broken stages be linked together ? Expressionistic abstractionism in the Pollock style is precisely the final stage of the glorious and intricate journey of the entire abstractionist movement . 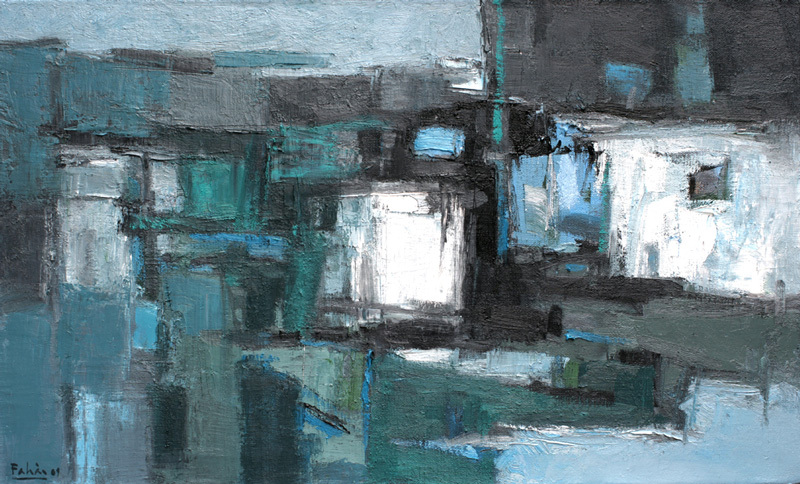 In the last two decades , abstract paintings have become familiar to viewers in Vietnam . Sereral artists even claim that they stem from remote primitive art or from the world famous Zen art . However , not many artist are well versed in this genre of art . We can cont Pham An Hai amongst those rare artists .